Posted on 17, December 2015 by EuropaWire PR Editors | This entry was posted in Norway, Telecom and tagged 200 million subscribers, Atle Følgesvold, Sigve Brekke, Telenor. Bookmark the permalink. Fornebu, Norway, 17-12-2015 — /EuropaWire/ — Telenor Group today announced that it has surpassed the 200 million mobile subscriber mark. This represents a significant milestone in Telenor Group’s history across Asia, Europe and the Nordics. “Many in Telenor can remember reaching one million subscribers – a once-historic milestone. Since then, the world has changed dramatically and with it, the role of the mobile phone. Today, Telenor is in the hands of more than 200 million people from Malaysia to Norway. Telenor´s early explorers of the 1990s aspired to bring the benefits of mobile communications to everyone, but they could hardly have imagined the impact we witness now. Today, our vision goes beyond putting a phone in every hand. We envision an internet for all, and with it all the opportunities that a digital life brings,” said Sigve Brekke, President and CEO of Telenor Group. As the world evolves to view connectivity as a basic necessity, Telenor Group will continue its work in enabling connectivity for all. At the same time, Telenor is exploring new ways to sustain growth, capture customers’ attention and create value for them. Telenor Group is present in 13 markets across Asia and Europe. The company entered Hungary 21 years ago and established its first Asian operation in 1996. Telenor has since emerged as a leading global mobile operator. As of the third quarter 2015, Telenor Group’s six Asian operations generated more than 50 percent of the group’s total revenues and Norway and the rest of Europe about 20 percent each. 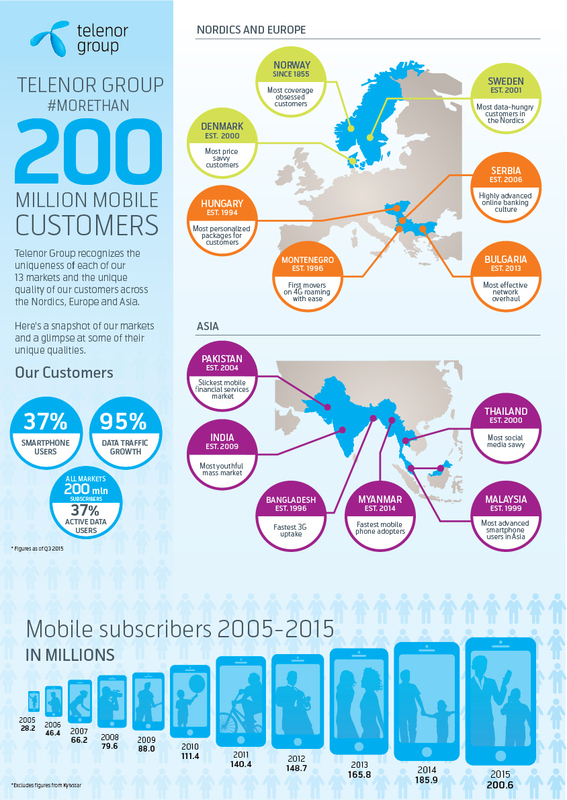 Telenor Group has added more than 170 million subscribers in the past decade. “Telenor Group is a truly global company, with a broad geographic footprint and a brand and logo visible to more than one billion people. It is based on a strong Norwegian heritage and has propelled into a global brand that ranks amongst the top four in Scandinavia and amongst the top 200 in the world. By connecting its consumers, giving people access to the internet and digital services, Telenor is enabling people to drive business, improve their lives and contribute to building a better future for society,” said Atle Følgesvold, consultant at global market research firm TNS. Telenor Group recognizes the uniqueness of each of its 13 markets and its customers across the Nordics, Europe and Asia. Here is a snapshot of our presence and some of the unique attributes of our markets.